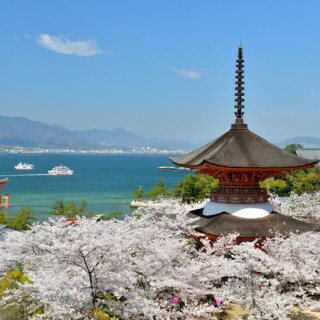 > Travel > 10 Spots of Kiyomizu Temple, Kyoto that You Must See! 1. 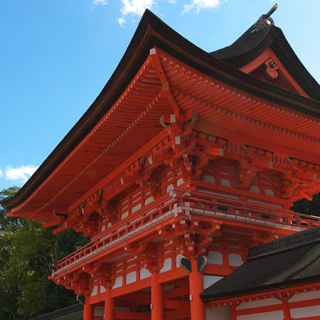 What is Kiyomizu Temple? 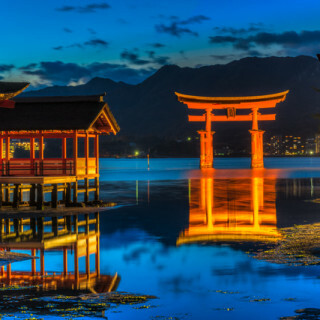 The Main Hall of the Kiyomizu Temple is designated as a national treasure, while the Nio Gate, Front Gate, and the Three-storied Pagoda are all classified as important cultural properties of Japan. The entire mountain is filled with a historical charm, but the most notable part of the Kiyomizu Temple is undoubtedly the “Stage of Kiyomizu”. 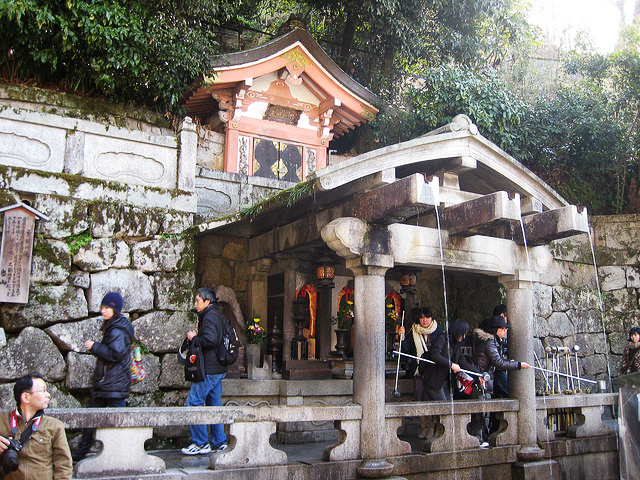 There is also the Juichimen Senju Kannonzo, which is the principle object of worship at Kiyomizu Temple. 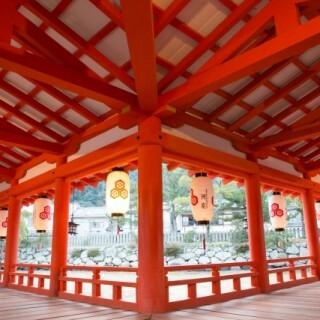 Before vising the famous “Stage of Kiyomizu”, you can first pay a visit to the Main Hall. 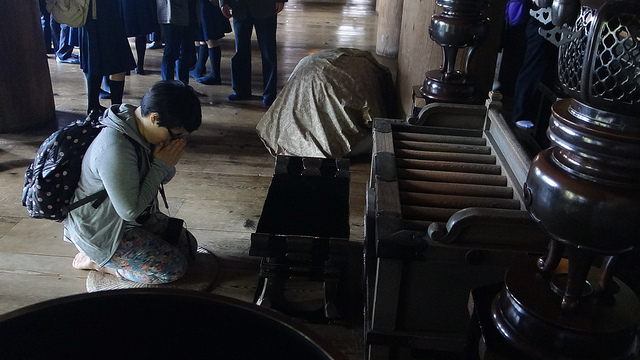 Here, you can get a feel for how the aristocracy of the Heian-era (794 – 1185) used to live. 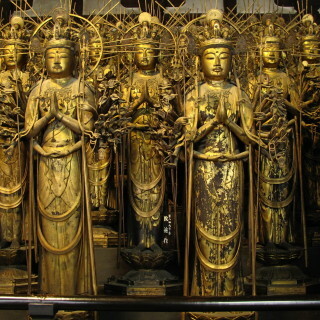 In the vast and wide hall, there are numerous Buddha statues, wooden fittings with elaborate designs, and countless “ema”, which are small wooden plaques where Shinto worshippers write their wishes and prayers. All in all, this hall is filled with a remarkable, historical atmosphere. Geta is a type of traditional footwear that look like sandals, but has an elevated base. Shakujou refers to a priest’s staff. Both of these are typically made of wood, but at the entrance of the Main Hall, you can find geta and shakujou that are made from steel. The Steel Geta weighs 12kg (26lb) and the Steel Shakujou weighs 90kg (200lb). These are both dedicated to Benkei, who was a famous warrior monk that received his training at Kiyomizu Temple. He was well known for his exceptional strength, which is expressed through this extremely heavy footwear and staff. When you visit the Main Hall, please feel free to hold these steel objects in your hands to see how heavy they really are. 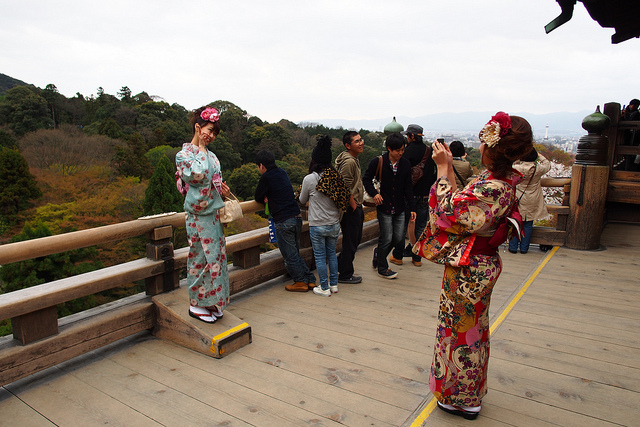 Once you get through the Main Hall, you will find yourself at the “Stage of Kiyomizu”. The famous story behind this is that in the Edo-era (1608 -1868), it was believed that if you could jump off the Stage of Kiyomizu and survive, your wish would come true. 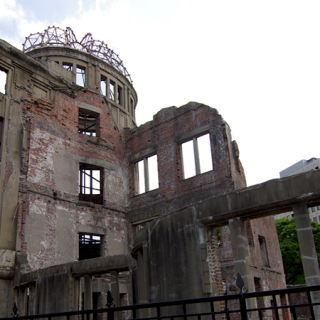 The stage is 12m (40ft) high, which is equivalent to four stories. More than 200 people jumped, and around 85% survived. Jumping off the Stage is now forbidden. The Stage of Kiyomizu was made using a technique called “kake-zukuri”. This method is highly unique, for not a single nail is used in the building process. The view you get from here is very different from pictures you may find in a guide book, which are typically taken from outside. From the Inner Sanctuary, however, you can take photos of the Stage from the inside. 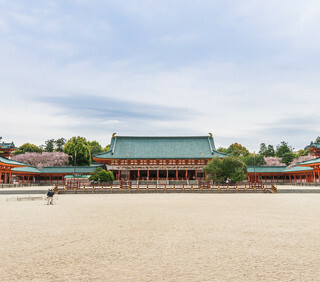 The Inner Sanctuary has a similar build compared to the Main Hall, and not only can you take pictures of the Stage from here, but you can also enjoy the excellent view. From the Kiyomizu Temple, you can look over the city of Kyoto. 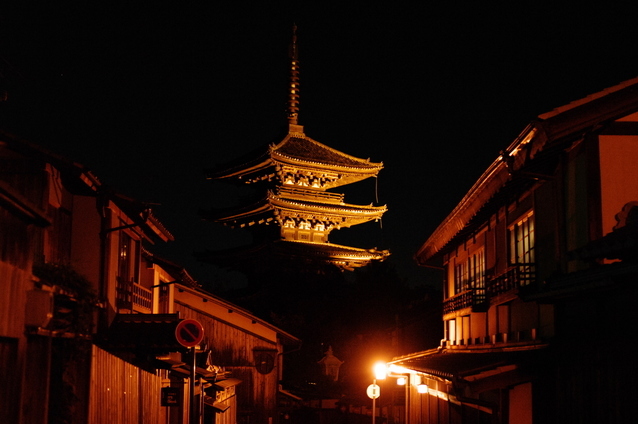 Depending on where you stand, you may also be able to see the Yasaka Pagoda (Five-Storied Pagoda) at Hokanji. 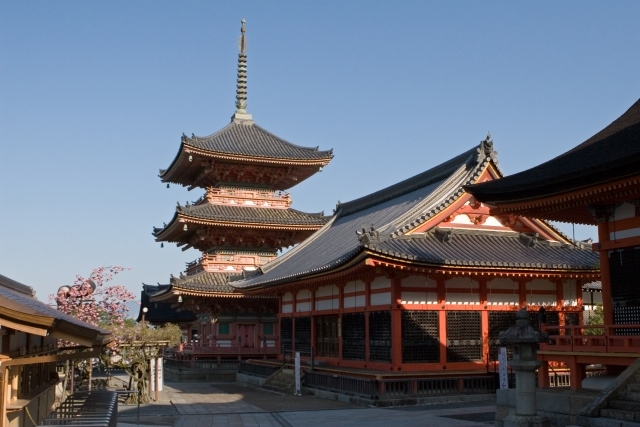 Hokanji is another famous Buddhist temple that is located nearby. At night when everything lights up, the view seen from here is amazing. 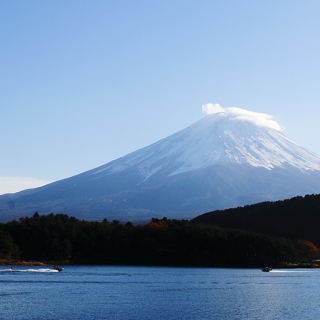 Especially in the fall when the leaves change color, and in the spring when the cherry blossoms bloom, the view here is absolutely phenomenal. Next to the Inner Sanctuary, you will find the Otowa Waterfall. This waterfall is where the Kiyomizu Temple’s name originally came from, for “Kiyomizu” literally translates to “pure water”. Here, you can find sacred water called “golden water” (ougon-sui) or “eternal water” (eimei-sui). There are three separate channels where the water comes out from, and each is said to have a different benefit. However, it is traditional to drink out of only one of the three channels. If you drink out of two separate channels, the benefits will be reduced to one half. If you were to drink from all three channels, the benefits will be reduced to a third. This is meant to be a lesson that teaches one not to be too greedy. Standing at the entrance of the Kiyomizu Temple is this Nio Gate. 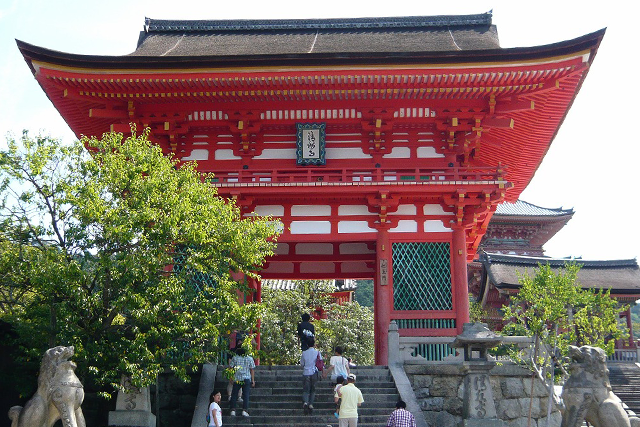 This vivid, crimson gate is classified as an important cultural property. 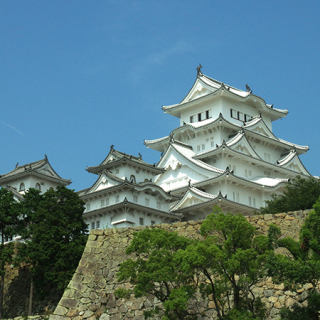 This was built in the Muromachi-era (1336 – 1573) which was known as the “Samurai Era”. The main characteristic of the Nio Gate is that it expresses the mighty spirit of the samurai. On either side of the Nio Gate is the Kongou Rikishi Statue (also known as the Nio Statue), which is considered to be the guardian of Kiyomizu Temple. Visiting the temple every day to pray is considered an expression of strong faith, and is said to bring about a much greater divine favor. 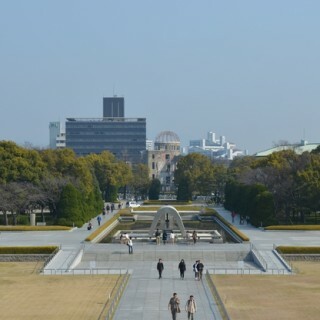 Realistically though, it’s usually not possible to visit every single day. However, there is one day of the year known as Sen-nichi Mairi (“sen-nichi” translates to “thousand-days” and “mairi” means “visit temple”). If you visit the temple on this particular day, it is said that you will be blessed as though you had actually visited for one thousand days. 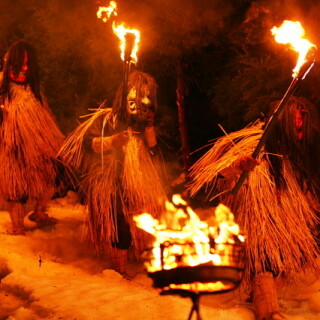 Around the same time of year, there is another day called Yoi-Mairi (“yoi” translates to “night”). On this day, it is possible to visit the Main Hall at night. 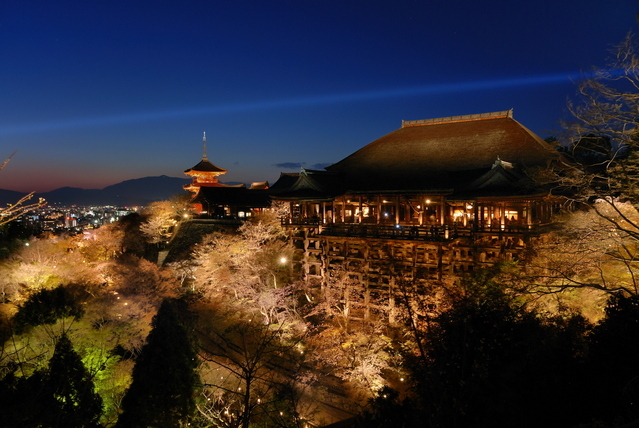 It may be interesting to visit Kiyomizu Temple on one of these special days. 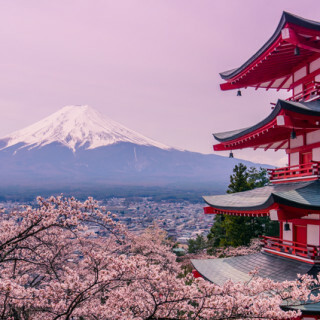 Much like the Main Gate, the Three-Storied Pagoda has a gorgeous building style, and is another one of Japan’s important cultural properties. There are many three-storied pagodas in Japan, but this one at Kiyomizu Temple is the biggest of them all. 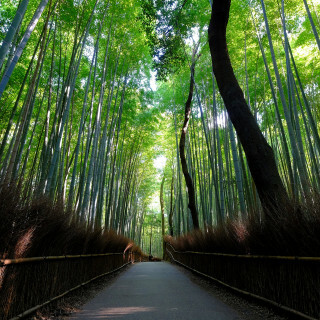 For ages, it has been known as a symbol for Kyoto. The fine details of the designs are, in particular, the most noteworthy. 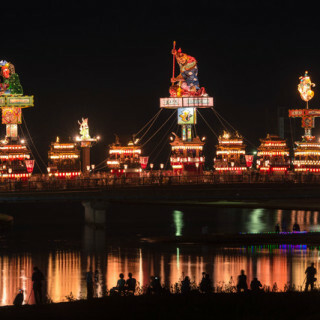 Three times a year in the spring, summer, and fall, there is a special opportunity to visit the temple at night. The way everything lights up turns the view into a truly magical and wondrous scene. 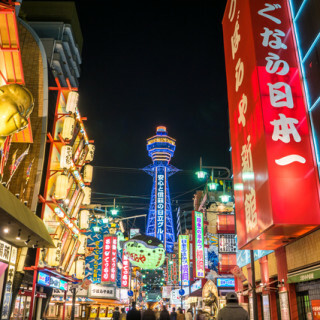 It is a view that is quite different from what you can usually see from Kiyomizu Temple, and therefore, would surely be worth a visit. Everything that was introduced thus far is all supported and protected by the principle object of worship, the Juichimen Senju Kannonzo. This differs from a typical Senju Kannonzo in that this particular one has both of its arms raised high above its head. This is now known as the “Kiyomizu-form”. This unique posture is said to bring about an exceptional divine blessing. 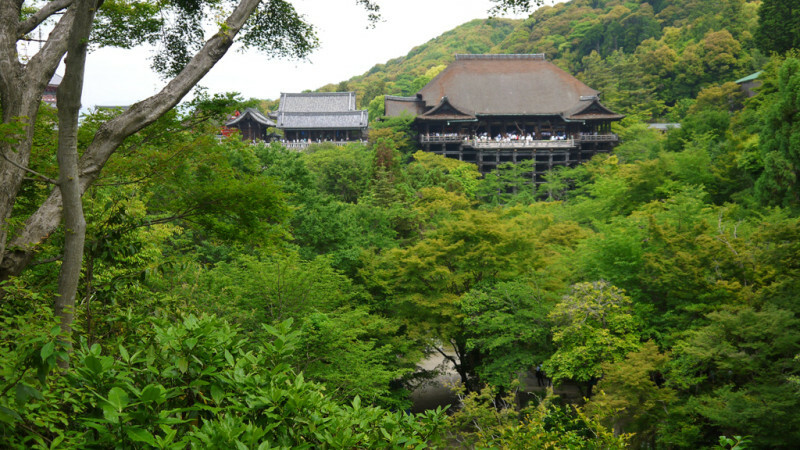 For centuries, Kiyomizu Temple has been known as a wonderful temple. It may very well be, that this is all thanks to the protection provided by the Senju Kannonzo.